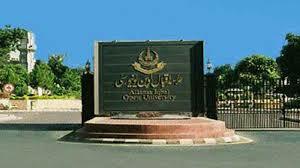 ISLAMABAD: Allama Iqbal Open University (AIOU) will open its Matric to PhD level admissions for the semester Spring, 2018 from February 1 simultaneously across the country. Vice-Chancellor Professor Dr Shahid Siddiqui has approved an admission plan that includes setting up prospectus’ sale points at its main campus, regional and coordinating offices throughout the country. Admission forms and prospectuses can be obtained from the sale points at the main campus, regional campuses and coordinating offices around the country. Admission forms along with the required fee can be submitted at the nation-wide branches of Habib Bank Ltd, First Women Bank, Bank Alfalah, Allied Bank and at the designated branches of National Bank of Pakistan and Muslim Commercial Bank. The detail of designated branches is available in the prospectuses as well as at the regional offices. Admissions director advised the students to submit their fee to the bank on their own. He further said that fee in shape of bank draft/pay order will not be accepted. Continuing admission forms are being dispatched to the continuing students, however, if somehow, any of the students do not receive the said admission form till the second week of February, he/she can download the same from the AIOU website www.aiou.edu.pk and submit in any designated bank branch with fee till due date to avoid late fee charges. msc math k lye class semester mn kitnay time hoge? BBA ya B.Com k lya classes lyna compulsory h?? Is BS microbiology offered in AIOU Admission scheme for spring 2018? ?? Though if it is then what’s the methodology of classes ? Yes aiou admissions start from February.This is real post and very latest new about admission.If any one want to join this university please contact me.